The Orange Kingdom is the second kingdom linked to the D Barrel which appears in Donkey Kong Jungle Beat. The Orange Kingdom can be accessed by collecting one Crest. Donkey Kong travels through this kingdom to fight Scruff Roc, the foe who rules the kingdom. At the end of each level in this area, Donkey Kong must bite into a giant orange to complete the stage. Silver Snow Peak is the first area of the Orange Kingdom. It takes place on the base of a snowy mountain. Donkey Kong has to reach the peak of the mountain. 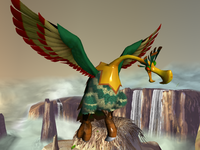 He meets his second Jungle Buddy, Hoofer here and rides him through the entire level. Iguanagon tries to stop Donkey Kong and Hoofer by chasing after them here as well. For every ten meters traveled in this level, Donkey Kong gains a beat. Unlike the other levels, Donkey Kong does not need to eat the giant fruit at the end of the level, and he only has to touch it to finish. After touching the fruit, he must jump over wide gaps with the buddy to gain extra beats. Sky Garden is the second area of the Orange Kingdom. Donkey Kong utilizes the unique plants growing in the sky to propel himself to higher areas. Donkey Kong also encounters a chicken-plant hybrid, known as a Kobu Kokko, who can be defeated by clapping. In the second half of the level, Donkey Kong is aided by the Helper Monkeys to reach higher areas and, overall, progress through the level. Donkey Kong must then fight Scruff Roc, a massive, green and yellow bird carrying a black egg, on a massive ledge, with two rock walls, and a nest in the background. Scruff Roc attacks by launching its spiky feathers at him. To defeat Scruff Roc, he must attack the massive egg it carries, by headbutting it. Upon reaching half health, Scruff Roc moves somewhat faster, and he can only be attacked after striking the egg, which confuses it. Once its health is low enough, the egg starts smoking. Upon being defeated, the egg explodes, and Scruff Roc along with it. Its feathers then fall to the ground. This page was last edited on April 12, 2019, at 12:45.